This apartment is in Chapel Hill. Nearby parks include Jordan Lake, Emily Braswell Perry Park and Battle Park. Environs Lofts at East 54 Apartments has a Walk Score of 56 out of 100. This location is Somewhat Walkable so some errands can be accomplished on foot. Environs Lofts At East 54 offers 58 upscale apartments in the vibrant East 54 neighborhood of Chapel Hill. Located just one mile from UNC’s campus and less than 3 miles from UNC Hospitals, getting home has never been easier. Residents enjoy bright, airy one and two bedroom lofts fully equipped with luxury finishes and the modern conveniences that suit an on-the-go lifestyle. 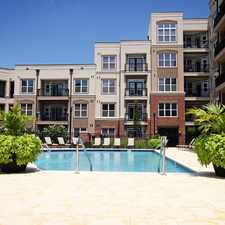 Environs Lofts features everything you would want in resort-style living, including a 24-hour state-of-the-art athletic club, expansive rooftop swimming pool surrounded by a massive sundeck overlooking the renowned, UNC Finley Golf Course. When it’s time to slow down and relax, the neighborhood coffee shop, and sports bar are just steps away. As a resident you will enjoy exclusive resident only discounts at East 54 neighborhood restaurants and retailers! Environs Lofts combines the comfort and convenience you have been looking for, in the perfect location for embracing all that Chapel Hill has to offer. Explore how far you can travel by car, bus, bike and foot from Environs Lofts at East 54 Apartments. Environs Lofts at East 54 Apartments has some transit which means a few nearby public transportation options. Car sharing is available from RelayRides and Zipcar. Environs Lofts at East 54 Apartments is in the city of Chapel Hill, NC. Chapel Hill has an average Walk Score of 36 and has 57,233 residents.